Successfully Added Mini CCTV Security Camera with High Resolution 520 TVL (Video + Audio) to your Shopping Cart. Mini CCTV Security Camera with high resolution 520 TVL for superior image quality: This cool and easy to install micro camera comes with the quality and convenience you need to perfectly monitor your home/office or covertly on others. 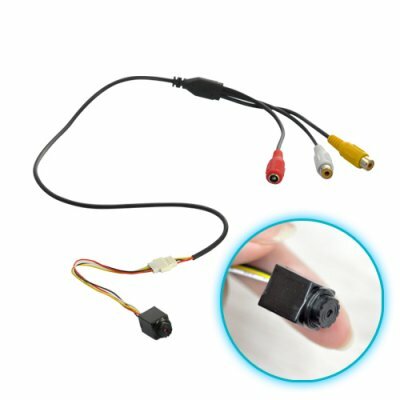 This micro camera comes in a size of a tiny peanut and can be easily installed at a great many locations to capture both video and audio. Place it on the living room bookshelf and check out on the big TV screen in your bedroom what the nanny is doing to your kids, or install it to see in your own comfortable office if your employees are chatting, watching videos, or playing chess online while you are not around. The applications are virtually unlimited! Crisp Clear Images, Even at Night! With a 1/3 CMOS image sensor and a resolution of 520TV lines, this mini CCTV security camera captures the action nicely in great images. Even at 0.008lux (pretty dark!) illumination level, images are just as sharp and clear. This will be especially useful for those low light areas and dark corners of the room. A simple but effective surveillance camera brought to you by the original source for direct from China wholesale electronics, Chinavasion. This product also comes with our 12 month product warranty. Order today and it will get shipped within a day! Monitor your home or business, on others and more. Unlimited applications with this tiny gadget! Captures both video and audio. Functions excellently even in low light environment. YES. This camera captures both video and audio.